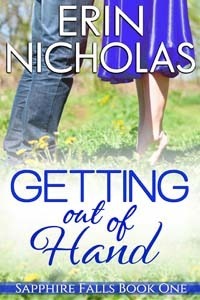 Currently Free on both Nook and Kindle! I can’t even begin to tell you how much this book made me smile. Heartwarming with lots sizzle is exactly how I would describe it. I won’t fluff this book up and tell you it was the most amazing dang book I’ve ever read, but it -was- a really good book. I would definitely recommend it to those that enjoy a good love story. Mason is rich, intelligent, witty, straight forward, and he just wants to do his job! So when his best friend tells him to leave, literally, and get out of Chicago for awhile, he heads back to his hometown, Sapphire Falls. This is a guy who hasn’t been back in years, has no reason to go back and basically suffered one of the most humiliating moments of his life there. He’s grown up, matured and made a success of himself and now they want -him-. He just wants to save the world one tomato seed at a time, not deal with all the political hoopla. Adrianne is originally from Chicago herself. This woman comes from a fast-paced, incredibly stressful world, where it’s nothing but go-go-go and I’m not just talking about her job. Her whole lifestyle and society just doesn’t let up. Then something happens to her that makes her flee Chicago and that way of life. She ends up in Sapphire Falls, learns to love denim, and a completely laid back way of life instead. I can’t say these two meet with a bang and go up in smoke, but Mason does waltz in and pay $400 for three dances with Adrianne. She knows exactly who he is and he doesn’t know her at all because she’s a new face in town. (At least for him) She’s also intriguing however, and sees through all the political what-not around him. She actually sees -him-, the guy that likes to watch plants grow and play in the dirt. He comes to understand her, and she just makes things click for him, often at the most random times. (It’s a good thing she keeps a pen handy!) This leads to some twists and turns along the way. They fall in love, but that love is tested and it’s interesting to see how they both handle the issues that stand in their way. Thanks for the heads up on the freebie! I like this author. You’re very welcome! I try to watch for those, and I will post them if they are free at the time. This one was def a start to a new series I’ll be reading.